I have a weird bug that's cropped up. 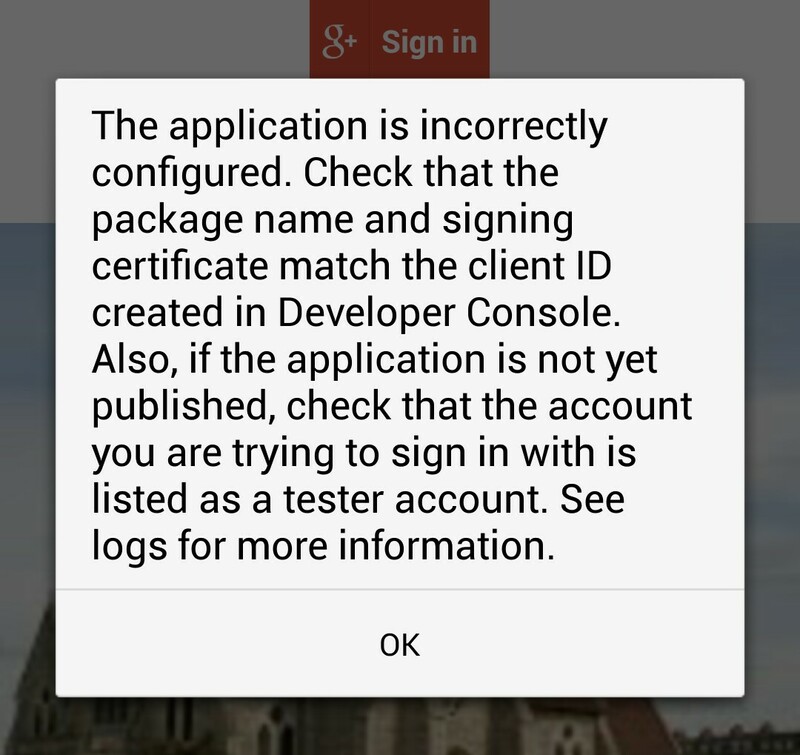 My app works perfectly when I sign it with the android debug key store. But when I sign it with my own key, users are unable to sign in. I get the message "The application is incorrectly configured. Check the package name and signing cerificate match the client id in the developer console"
I have done this and have added a new client I'd with the correct certificate and package name but it still doesn't seem to be working. Anyone know what else I could try or if there is a known issue? Ok all here is how I managed to fix it after a lot of trial and error. If you have created a client id in the google api console for your release certificate sha1 and release package name then delete it. Then proceed to follow the steps that it takes you through which will create a new client id. ( Even though the UI will look the same and Google will give no visual indication that you need to do anything more to get it working and make you assume that changes have been autosaved) Press the publish button. It will then give you a list of changes that it needs to publish. Press publish and after a few hours your app will start to work. In our experience, most problems of this nature can be solved by carefully following the steps indicated there. I had this problem because I forgot that in Android Studio you can't directly send an app to your device if it is a game being played through Google Play. If you do, you will get this error message. You have to instead in the Build menu of Android Studio, select Generate Signed APK..., and then send the app to your device from a console using the command "adb -d install <'app name'>.apk." Then since I had previously sent the app to my device directly from Android Studio, I proceeded to get the error message from adb of "INSTALL_PARSE_FAILED_NO_CERTIFICATES." To fix this, I had to delete from my device the app which I had previously downloaded from Android Studio. Then the command "adb -d install <'app name'>.apk" worked, and the app ran correctly. Not the answer you're looking for? Browse other questions tagged android google-play-games or ask your own question.